"In this universal assembly, in this privileged point of time and space, there converge together the past, the present, and the future. The past: for here, gathered in this spot, we have the Church of Christ with her tradition, her history, her councils, her doctors, her saints; the present: we are taking leave of one another to go out toward the world of today with its miseries, its sufferings, its sins, but also with its prodigious accomplishments, values, and virtues; and the future is here in the urgent appeal of the peoples of the world for more justice, in their will for peace, in their conscious or unconscious thirst for a higher life, that life precisely which the Church of Christ can give and wishes to give to them"
(from Pope Paul's closing message at Vatican II). This is the pope whose job was to implement the historic Council of Trent. If we think popes had difficulties in implementing Vatican Council II, Pius V had even greater problems after Trent than four centuries earlier. 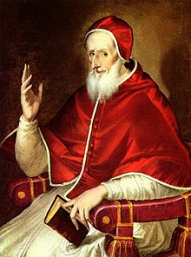 During his papacy (1566-1572), Pius V was faced with the almost overwhelming responsibility of getting a shattered and scattered Church back on its feet. The family of God had been shaken by corruption, by the Reformation, by the constant threat of Turkish invasion and by the bloody bickering of the young nation-states. In 1545 a previous pope convened the Council of Trent in an attempt to deal with all these pressing problems. Off and on over 18 years, the Church Fathers discussed, condemned, affirmed and decided upon a course of action. The Council closed in 1563. Pius V was elected in 1566 and was charged with the task of implementing the sweeping reforms called for by the Council. He ordered the founding of seminaries for the proper training of priests. He published a new missal, a new breviary, a new catechism and established the Confraternity of Christian Doctrine (CCD) classes for the young. Pius zealously enforced legislation against abuses in the Church. He patiently served the sick and the poor by building hospitals, providing food for the hungry and giving money customarily used for the papal banquets to poor Roman converts. His decision to keep wearing his Dominican habit led to the custom of the pope wearing a white cassock. In striving to reform both Church and state, Pius encountered vehement opposition from England's Queen Elizabeth and the Roman Emperor Maximilian II. Problems in France and in the Netherlands also hindered Pius's hopes for a Europe united against the Turks. Only at the last minute was he able to organize a fleet which won a decisive victory in the Gulf of Lepanto, off Greece, on October 7, 1571. Pius's ceaseless papal quest for a renewal of the Church was grounded in his personal life as a Dominican friar. He spent long hours with his God in prayer, fasted rigorously, deprived himself of many customary papal luxuries and faithfully observed the spirit of the Dominican Rule that he had professed.